angry chicken: this house is way into barrettes. this house is way into barrettes. Thanks so much for the book love! I feel so supported and good about the whole thing. . .it's hard to put into words, except to say thank you. I am not really able to stay focused on any one big project right now (like the the quilt and blanket I have started and not finished for this baby) so, I jumped to something else and I tried my hand at some felt covered barrettes last week and these are quick and easy. They go together so fast, it won't make me crazy if we lose them. I had stolen some glances at a pair at a b-day party last week and these are a close approximation of what that toddler was wearing. I think she really wanted me to stop messing with her hair. I just pretended it was normal to take a child's barrette out, examine it, and hastily try to get it back in her hair unnoticed. . . . and didn't make eye contact with the mom (bad me). . I think I got away with it. That, or I will be on a birthday party blacklist. 1. 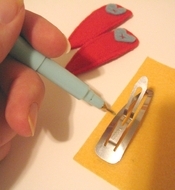 I traced the outline of the barrette onto (wool) felt with my trusty water-soluble pen. I use wool felt because the other stuff freaks me out and these colors are to die for. 2. Then, I cut a second piece of felt out the same size as the first and laid it behind the top piece, trimming it a bit shorter in the length. I flipped both pieces over and sewed right on the drawn outline I made with the pen (the second shorter piece of felt will be on the bottom, so you won't see it while you sew.) What you are making here is a barrette sleeping bag. I used brown stitching on the bottom so you can see it for clarity, but on the top, make sure the thread matches the felt, it's much more forgiving that way. 3. I trimmed very close to the stitching with really sharp scissors. I tried pinking sheers too, and it was nice, but made the overall shape bigger than I wanted. I have seen edges done with baby scallops, and they are way cute, so that would be fun to try, too. I slid the barrette into its sleeping bag to make it all cozy and sprayed off any blue line left with water. 4. You probably don't have to do this, but I sewed a little button/felt shape, like a flower of a heart, on top through felt and then the bars of the barrette, so it will still open, but the sleeping bag won't slide off. 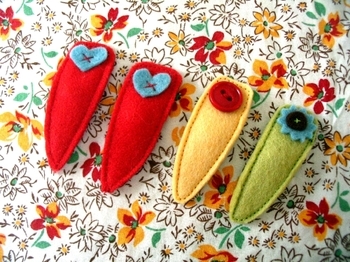 The girls love these so much because they are "clothes" for barrettes, which means the felt gets taken off and lost. To discourage this, the sewn on embellishment/button keeps it altogether. They still try to undress them, however. They are quite popular around here. Like so many things, it seems easier to make several of these barrettes, assembly-line style, than one at a time. I am wearing them too, which might be slightly questionable, but who cares. They go with the glitter glue on my shirt.